Teasers, updates, and new tournaments! In this update, which launched earlier this week, we improved the scoreboard based on community feedback and we will continue to iterate further to make it even more awesome! Have your burning questions ready! An old newspaper was flying around in space and the readers discovered that a group of space mercenaries escaped from prison on Carcaco back in 3584! 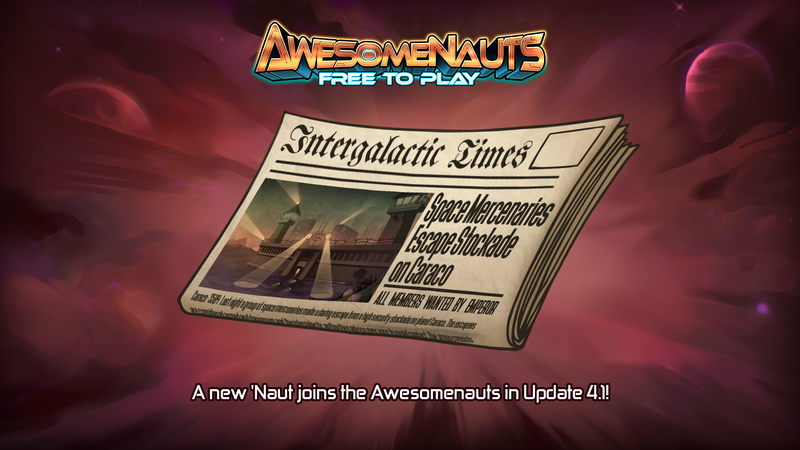 The new ‘Naut joining the game in Update 4.1 might have something to do with their breakout! The Awesomenauts League Project announced that there will be 3 events coming soon! Rookie Royale, Console Clash, and The Showcase were all announced during the stream. The sign-ups for the Console Clash and the Rookie Royale will start May 20th and May 24th respectively. In Squadnauts by CationF , every player will spawn with the same ‘Nauts following them (Lonestars spawn Lonestars, Clunks spawn Clunks, etc). They have a special custom AI and will follow you wherever you go, meaning you can have huge battles with lots of characters on screen!